Dedicated to the capital of independent Ukraine, one of the largest and most ancient cities in Europe, located on both banks of the Dnieper. From ancient times, the city had such a magical power that many prominent people declared to him in love. The city is famous for numerous monuments of culture, archeology, history, architecture and urban planning of various eras. Today, Kyiv is a political, socio-economic, transport, educational and scientific center of the country, a separate administrative-territorial unit in Ukraine and an administrative center of the Kyiv region. The location of the central authorities of Ukraine, foreign missions, headquarters of most enterprises and public associations working in Ukraine. On the obverse there is a coin: the upper - the Small State Emblem of Ukraine, circle inscriptions: NATIONAL BANK OF UKRAINE (above), FIVE HIRS (below), on the right - the logo of the Banknote-Mint of the National Bank of Ukraine; in the center there is a stylized composition symbolizing Kyiv: the parkway bridge is a pedestrian bridge across the Dnipro, linking the central part of Kiev with the park area and the beaches of the Trukhanov Island; to the right - St. Sophia Cathedral and its bell tower; in the center there is the building of the Verkhovna Rada of Ukraine, to the right of which is the year of issue of the coin 2018; Column of Magdeburg Right (left), coat of arms of Kyiv (XV century), the oldest image of which is contained in the emblem of Konrad Grunenberg; chestnut twig - a symbol of Kiev (below). 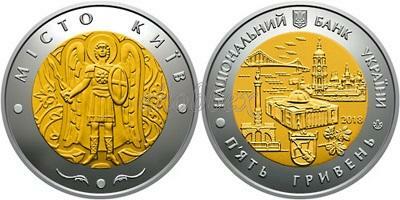 On the reverse of the coin is located: Archangel Michael - patron of the Kiev land, the city of Kiev, the image of which is located on the emblems of Kiev, Kiev principality, Kiev province, Kiev province; inscriptions CITY KYIV (above), decorative elements (below).